Here is a brief video reviewing what the market did last week and what to expect in the coming week. Hee is a video on reviewing the market indices and where it might be headed. Today UNG, the natural gas ETF opened with a big up gap and moved above the resistance level near $20. Then it settled in and traded within the 19.70-20.00 range during the entire morning session. After the noon hour, UNG profit taking started to take hold and it ended down 0.15 for the day. Here is a brief video looking at UNG's price actions and where the next long entry might be. Here is a look at the market indices and a look at couple of the market leading stocks: AAPL, IBM. Here is a video that takes a look at some of the financial stocks after Moody's downgrades. Market did a quick sell off and moved below near term support. This could be a shakeout before the next up move. Need to be cautious and be patient. Wait for the market to give clear indication which direction it will take before initiating any long or short positions. Watch the video for key levels to monitor. With the crude oil prices coming down, keep an eye on the airliners for potential upside move. The market is still poise to move higher. Could see a near term consolidation before breaking out to higher ground. 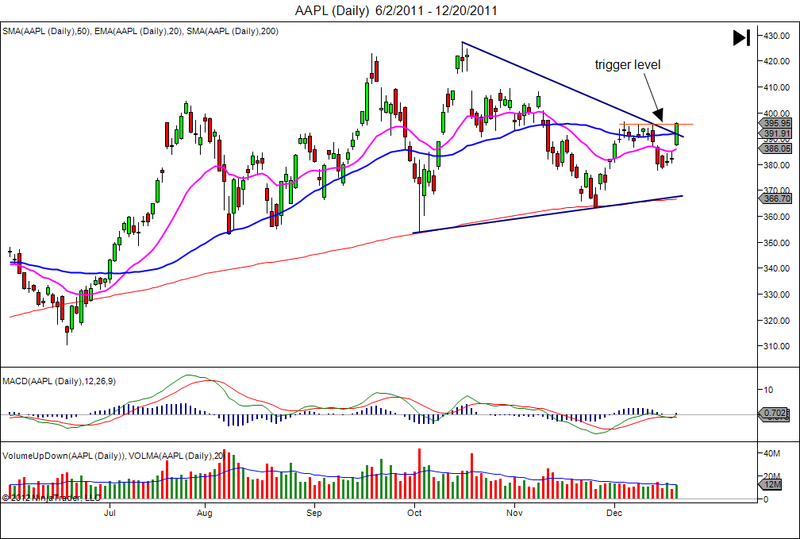 Monitoring AAPL to break above the $590 level. Look for possible move to 620 area when it breaks above $590. It appears natural gas has made a low term low and its ETF, UNG has made some big moves recently. GT (Goodyear Tires) is breaking out a resistance level with huge single day move. It was up more than 7% during intraday in the last trading session. Looking for possible more upside move from UNG & GT. 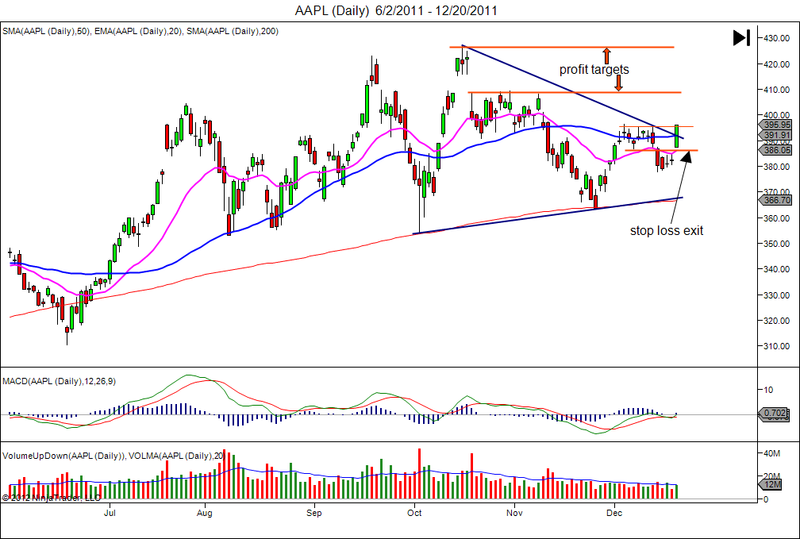 Watch the video for more details, including latest move from AAPL. Here is a video recapping on what the market did and where it could be headed along with updates on BAC, MS, GS, WFC, JPM and C.
Where Is The Market & AAPL Headed? 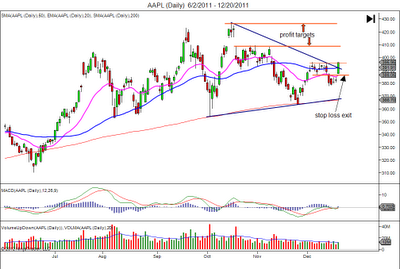 AAPL still confined in a trading range between 550-580. It could be setting up a small inverted H&S pattern with a measured move to possibly targeting the all time high of 644. Next week is OPEX & AAPL WWDC, beware of additional volatility and potential head fakes. Check out the video for details. Video review of the market and possible levels to monitor for the coming week. For the email subscribers, click on the post title to view the video. Here are couple video posted this weekend reviewing the market indices and some of the factors that will likely keep the downward pressure on the equities market. In order to survive in trading, one must have a systematic approach for putting on a trade. For me, I use a three steps approach. The three steps are: 1) the setup, 2) the trigger, 3) the exit. The first step is to identify a setup. The setup can be anything that you find to give you an edge in the long term. The edge does not have to have a high win/loss percentage. It can be an edge based on high average winnings/average losses ratio. There are successful traders that use setups having win/loss percentage in the 30% range, but with very high average winnings/average losses ratio. Essentially, these setups experience many small losses with few big winnings. And the winnings are much more than offset the losses. Setups can be based on a particular price action, a corporate event, seasonality factors, etc. The setups I use are based on price actions. 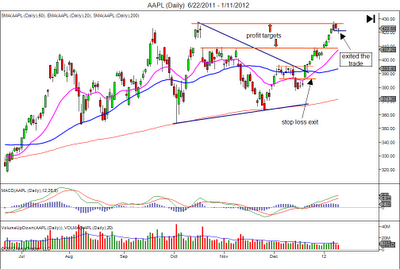 Some of the setups I use are: formation of a price pattern, a breakout of a trend line, a bounce off a support. 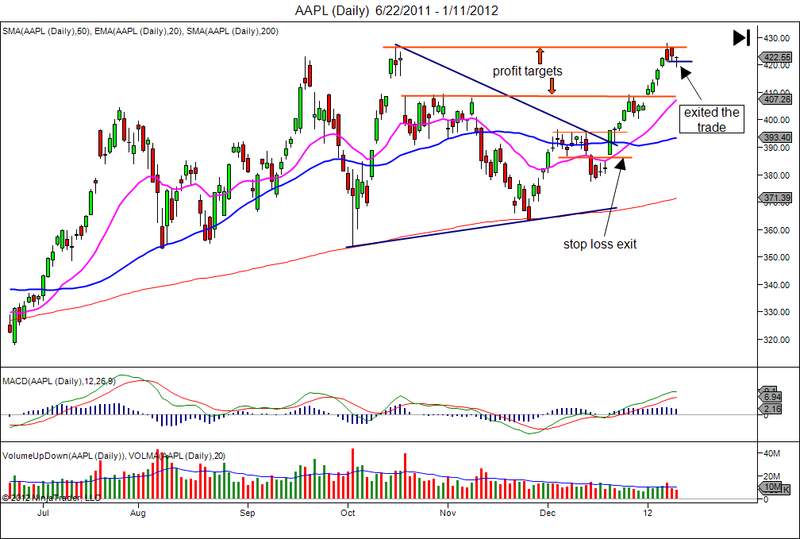 Here is an example of a price pattern setup I recently used for a swing long trade on AAPL. 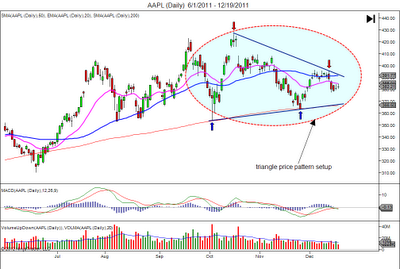 This is a triangle price pattern with two successful bounce off the 200 SMA. After a setup has been identified, the next step is to determine a trigger level. In this example, the trigger level is the breakout of the last price point that backed off from the upper descending trend line of the triangle. 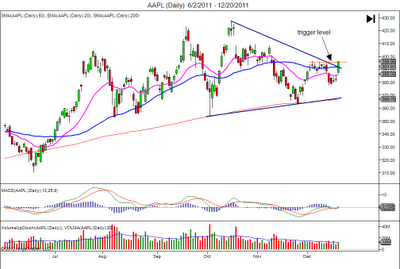 Notice the multiple test of the trigger level prior to the last pullback. Once the trigger has been established, the final step is to identify the exits. I consider this to be the most important step of a trade. The first and foremost exit is the stop loss. This stop loss level and the trigger level will definite the risk and help determine the position size for the trade. This is like an analogy to a game of blackjack. You determine how much you want to wager for a hand of blackjack, and the amount you have wagered is the amount at risk (provided you don't take those sucker bets such as insurance on a dealer's Ace face card or split & double down.) Without having determined the risk to place on a trade is like playing a hand of poker betting all-in without looking at your cards. This type of poker strategy can mean game over for you on a single hand, and without establishing the risk for the trade can blow up your trading account on a single trade. In addition to the stop loss exit level, potential profit exit levels are also identified. These exits levels will determine if the trade is worth the risk. In my trading plan, each trade must have the potential to return multiple times of the risk taken. If the profit exit levels show the trade have the possibility of returning at least two times the risk, then the trade will be taken when it trigger. I believe using these three steps to put on a trade have helped me on reducing impulse trading and reduce the emotional roller coaster after the trade is put on. It defines the risk and establishes a plan on managing the trade...before putting on the trade. Here is what happened to the trade. 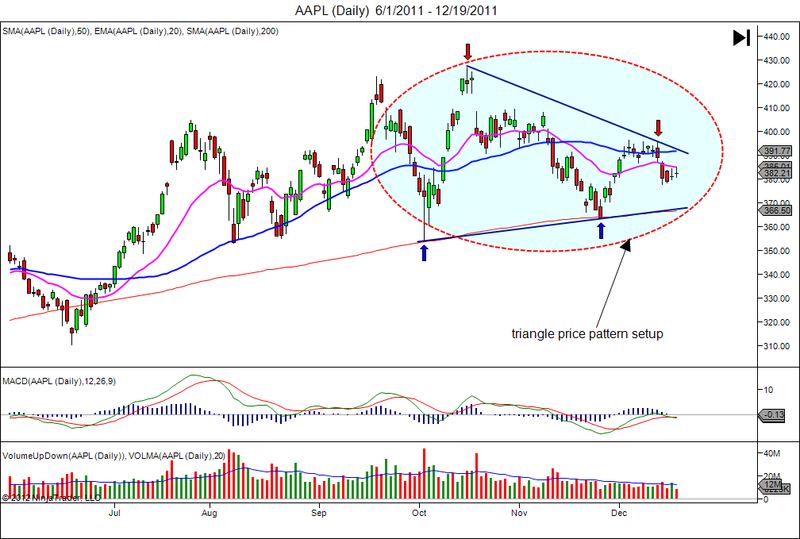 I can assure you, most of my trades do not work out so perfectly as this AAPL trade. I hope this three steps approach to a trade will help provoke some thoughts to some of you on how to improve your trading strategy. Here are couple video review the market indices and the following stocks: AAPL, IBM, CRM, OPEN, PCLN.